Group photo of Community World Service Asia and International Medical Corps staff. Participants involved in a group activity of preparing a Food Package by using Sphere Minimum Standards. Rizwan delivering a session on Overview of Sphere Minimum Standards. Participants explored the Cross-Cutting Themes of the Sphere Handbook during a group activity. Group photo of Community World Service Asia and HelpAge International staff. 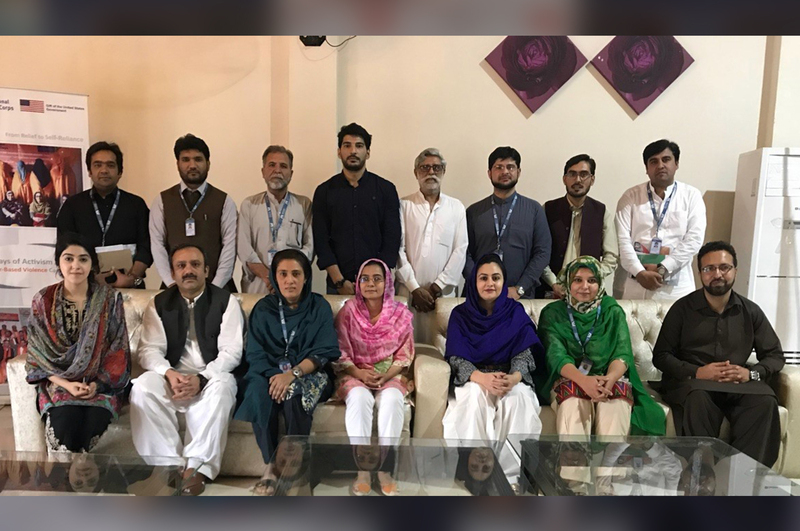 Humanitarian organizations in Pakistan are demonstrating increased commitment towards enhancing the capacities of their staff and partners on accountability standards to ensure quality assistance to the communities served. 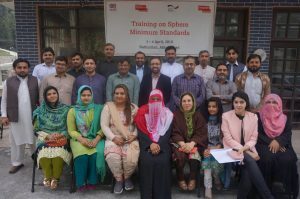 In April 2018, Community World Service Asia provided technical support through two trainings, one for HelpAge International (HAI) and the other for International Medical Corps (IMC), to introduce the Sphere Minimum Standards and Core Humanitarian Standard (CHS) into their organizational operations and implementation. The two-day trainings catered to thirty-four staff members, 32% women and 68% men, of HAI and IMC, who were all facilitated with practical support in applying the Sphere Minimum Standards as a tool to improve quality and accountability (Q&A) of their humanitarian action. Participants of this learning exercise were introduced to the CHS and its nine commitments, which have now replaced the initial core standards in the Sphere Handbook. Each participant recieved a copy of the CHS Guidance Notes and Indicators booklet by the end of these in-house trainings. Terms that are key to applying Q&A standards in humanitarian response globally, such as Commitment, Quality Criterion, Key Actions & Organizational Responsibilities were explained to the participants using clear examples cited from the CHS booklet. The session on CHS concluded with a screening of an animated video on introduction to CHS. Participants recognized the clear link between Key Actions and Organizational Responsibilities in their work by the end of the session. A detailed session on the Sphere Handbook was delivered as part of this technical support activity in which sections on Food Security and Health were particularly focused on. Practical exercises were conducted with the staff which ensured that each of them thoroughly reads and understands the standards well and can apply them in their contexts. Common issues identified in food security assistance were discussed with participants, which was followed by a thorough review of the standards on the very subject. Participants developed a common understanding on terms such as food security, livelihoods and malnutrition in the context of the standards. In a group activity, the participants were asked to prepare a food basket that met the standard on ‘General Nutrition Requirements’ recommended under the Sphere standards. As part of the activity, participants discussed the assigned standards and presented the items in a food package, along with cost and kilocalories calculation. To build knowledge on the Health Actions chapter of the Sphere handbook, the HAI and IMC staff were given specific scenarios to link common health issues with relevant minimum standards. They were also advised on linking it to key actions, key indicators, guidance notes as well as other relevant chapters of the handbook such as the humanitarian charter, cross-cutting themes and protection principles, all of which must be taken into consideration while planning and implementing humanitarian aid. This helped participants to understand the link between different sections of the Sphere handbook. 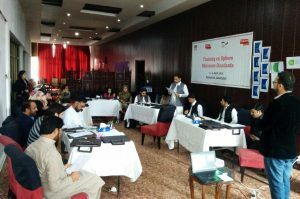 At the end of the training, participants prepared a three-month action plan, which would serve as a basis for follow-up. For most of the participants, the contents of the workshop were new, therefore, a more detailed workshop on Sphere and CHS was proposed. 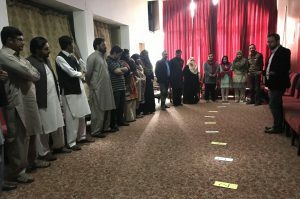 Participants recommended that field exercises can be included in future workshops to strengthen their understanding on linking theory with practice. 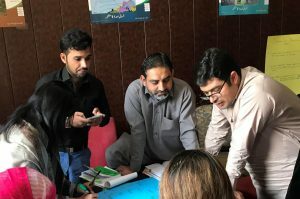 Community World Service Asia offered participants to avail coaching sessions and recommended to refer to Sphere and CHS while reporting and monitoring of projects. The staff at HAI and IMC are now able to differentiate between Sphere standards, CHS and their application and are well acquainted with the Sphere Handbook 2011 version.